I saw this thing posted on Unclutterer. There are a few charging stations on the market, and I’ve seen some great concepts by design students for this problem, but I’ve never seen one on the market at such a great price. The Driin Mobile Phone Holder is about $8, and looks like it doesn’t take up much room at all. 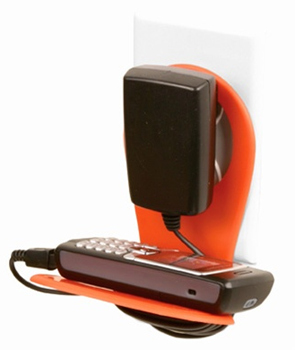 It uses the charger’s brick to hold itself to the wall and holds the device. Cord management is accomplished by just wrapping the cord around the holder. It wouldn’t be the best solution if you have a ton of devices you need to charge, but I think it would serve as a great home for things like mobile phones, handheld games, or music players. You can pick one up at Amazon.